Jess and Nicole are running away from home to California and making a road trip of it. This is the story of that trip and more specifically the horror that awaits them once they make a toilet stop along the way. As once Nicole emerges from the filthy toilets there, Jess is gone, and so is the car they have travelled in, she believes that she is alone…. This my good friends is most certainly not the case. 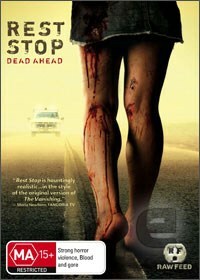 What follows is a ride into terror as Nicole is pursued by a maniac determined to get her at any cost. I really liked this film as it had a heap of really cool little twists built into it that kept you guessing as it moved along and introduced new characters to Nicole as she did her best to keep from getting killed. There is a high level of blood and gore in the flick and I guess if you are a bit squeamish, keep a bucket on hand! However she didn’t and what we are faced with is a balls to the wall movie with some really neat characters thrown in for good measure. The way that the plot races along, the movie never drags one little bit, the whole thing is one hell of a good piece of entertainment. What follows is shock after shock after shock and the ending is one that you will certainly not expect, well at least I certainly didn’t. In terms of extras, all we are given is a couple of alternate endings and a trailer whereas I would have loved to see a lot more there with commentary and make up effects etc. The overall quality of the audio and video is fine and makes for great viewing. Overall I think that you will get as much jumps and shocks as I did watching it. This is highly enjoyable and one that you will watch more than once.